Garden City is a city in and the county seat of Finney County, Kansas, United States. On the 19th (Mon), meet the residents at Lee Richardson Zoo and then see the interesting displays at Finney County Historical Museum. To find reviews, ratings, more things to do, and more tourist information, read our Garden City trip itinerary builder website . New York City to Garden City is an approximately 13-hour flight. You can also drive. You'll gain 1 hour traveling from New York City to Garden City due to the time zone difference. Traveling from New York City in November, expect slightly colder with lows of 29°F in Garden City. Wrap up your sightseeing on the 19th (Mon) to allow time to travel to Bella Vista. Bella Vista is a city in Benton County, Arkansas. Attractions like Dogwood Canyon Nature Park and Talking Rocks Cavern make great kid-friendly stops. You'll find plenty of places to visit near Bella Vista: 165 Scenic Overlook (in Hollister), Beaver Bridge - Little Golden Gate (in Beaver) and National Tiger Sanctuary (in Saddlebrooke). Next up on the itinerary: get great views at College of the Ozarks, explore the fascinating underground world of Bluff Dwellers Cave, contemplate the waterfront views at Elk River, and take in the spiritual surroundings of Mildred B. Cooper Memorial Chapel. To find traveler tips, reviews, and tourist information, read Bella Vista online holiday maker . Getting from Garden City to Bella Vista by car takes about 7.5 hours. Other options: fly. Traveling from Garden City in November, plan for somewhat warmer nights in Bella Vista, with lows around 39°F. Finish up your sightseeing early on the 23rd (Fri) so you can travel to Akron. Akron is the fifth-largest city in the U.S. Kids will enjoy The Wilds and African Safari Wildlife Park. Get out of town with these interesting Akron side-trips: Perry's Victory & International Peace Memorial (in Put in Bay), Hard Rock Rocksino Northfield Park (in Northfield) and St. Thomas Aquinas Church (in Zanesville). Spend a day of country life on the 29th (Thu) at Mill Creek Park. 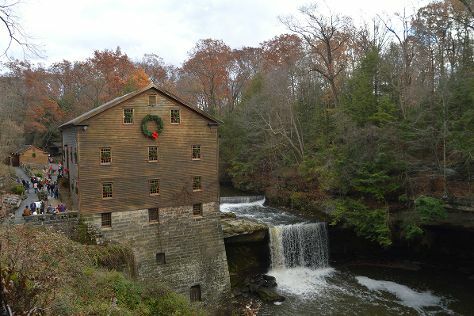 Spend the 30th (Fri) exploring nature at Cuyahoga Valley National Park. There's lots more to do: meet the residents at Akron Zoo, take in nature's colorful creations at Quail Hollow State Park, contemplate the long history of Stan Hywet Hall & Gardens, and look for gifts at Heini's Cheese Chalet. To find maps, where to stay, reviews, and more tourist information, read Akron sightseeing planner. Getting from Bella Vista to Akron by car takes about 13 hours. Other options: fly. The time zone difference moving from Central Standard Time to Eastern Standard Time is 1 hour. Traveling from Bella Vista in November, things will get a bit cooler in Akron: highs are around 51°F and lows about 34°F. Finish up your sightseeing early on the 30th (Fri) so you can go by car back home.